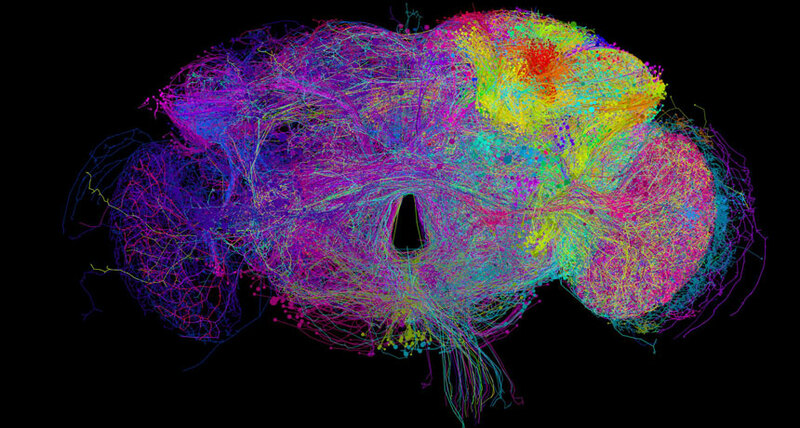 BRAINBOW Scientists have imaged the fruit fly brain in new detail. Colors highlight the paths of nerve cells that have been mapped so far. Cells with bodies close together share the same color, but not necessarily the same function. Experimental neurobiologists can now use the rich dataset as a roadmap to figure out which neurons talk to each other in the fly’s brain, says study coauthor Davi Bock, a neurobiologist at Howard Hughes Medical Institute’s Janelia Research Campus in Ashburn, Va. The rainbow image shown here captures the progress on that mapping so far. Despite the complex tangle of neural connections pictured, the mapping is far from complete, Bock says. Neurons with cell bodies close to each other are colored the same hue, to demonstrate how neurons born in the same place in the poppy seed–sized brain tend to send their spidery tendrils out in the same direction, too.